It has been 14 years since the first Incredibles hit theaters in 2004. Back then, superheroes weren’t such a big deal. But now they are at the forefront of the film industry. Most, if not all, are record-breaking films. But what separates Incredibles from the Marvels and the DCs is its timeless classic vibe. Now Incredibles 2 has finally arrived. The sequel may look like it’s taking place in the ’60s, but it is able to connect to a modern audience with its likeable characters and universal stories. We were fortunate enough to sit down with our fellow journalists to talk to the cast and director Brad Bird about the long-awaited sequel. During our time, Bird spoke about why it took so long to do a sequel, some of the changes he made, and making a film for everyone of all ages. Check out what he had to say, below. Like all Pixar films, there is always one short that precedes the feature. And Incredibles 2 is no different. Before audiences get into the thrill of watching the animated superhero sequel, they will get to see the tasty Bao. Pixar’s latest short is a play on the fairy tale story of the gingerbread man. 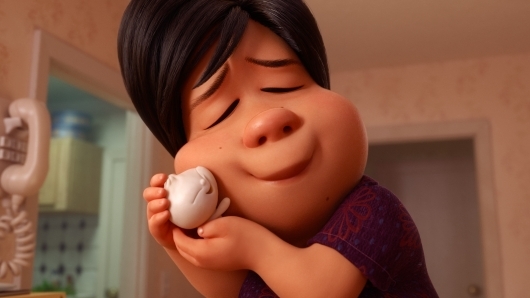 In Bao, a Chinese mother is now adjusting to her new life as an empty nest parent. But she gets a second chance at motherhood when one of the baos she made comes to life. From there she learns to care for it as if it were one of her own. The word bao actually has two meanings. One means the delicious title food. Another means treasure. Directed by Domee Shi, the short draws a lot of inspiration from her own upbringing. So it makes sense that she use the dual meanings of Bao in the film to reflect upon her life. Where there was plenty of food and her mother treated her as one of her precious treasures. We had a chance to talk to Shi and producer Becky Neiman-Cobb about capturing the spirit and Asian culture and putting it into the short, what its like to be the first Asian female director for a Pixar short, the road to becoming a Pixar short, and more below. 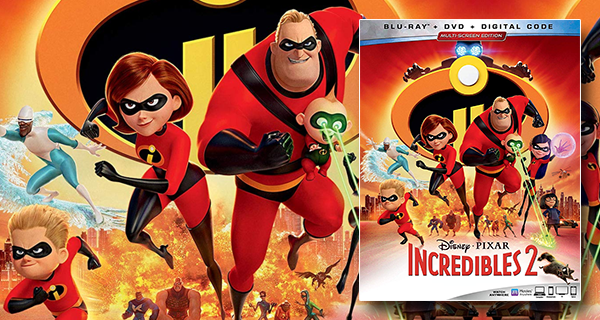 Incredibles 2 follows the Parr family as they enter a new phase in their lives. Helen Parr aka Elastigirl (Holly Hunter) takes up a new superhero job, leaving her husband Bob Parr (Craig T. Nelson) to hold down the fort in their new home. But he soon discovers that fatherhood isn’t as easy as it looks. Dash (Huck Milner) has trouble with his math homework. Violet (Sarah Vowell) has a crush on a boy, who had his memory wiped. And Jack-Jack has developed new powers. All of this is happening as Elastagirl is investigating a new villain who is bent on controlling the world through media screens. So as Mr. 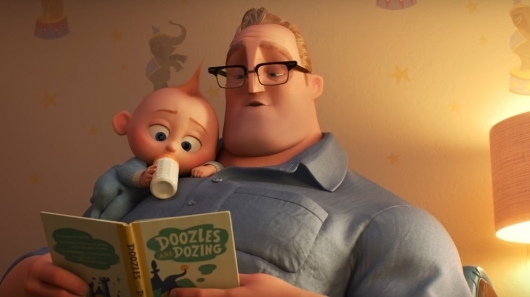 Incredible is trying to live up to his name as a father, he will get some big help from his friend Frozone. Samuel L. Jackson returns to reprise the cool and icy hero. If his role in this and the Marvel Cinematic Universe tell us anything, it’s that he plays characters that are the glue that binds his superhero families together. Whether it’s the father-figure in The Avengers or the surrogate uncle Frozone in Incredibles 2, you can always rely on his character to be there. We were invited to sit down with our fellow journalists to talk to Jackson, the cast, and director Brad Bird about their experience on the sequel. Check out what Jackson had to say about his parental-like roles in Incredibles 2 and The Avengers, and if kids recognize if he’s Frozone, below. The Incredibles is that perfect blend of fun and nostalgia. It’s that call back to a time where things were much simpler, but there was still a world that needed saving. There was no social media. Fun actually consisted of going outside and getting fresh air. And yet, the themes explored in that film still felt very relevant to the time of its release. Insecurities, loss, family. Everything about it was signature Pixar. Those poignant themes mixed in with a whole lot of fun. And who doesn’t love a good superhero movie? Flash forward 14 years later. Superhero movies are now all too common. There are those who are worried about superhero fatigue. Some even roll their eyes at the fact that another is released or are shocked that there is a sequel. But not so much with Incredibles 2. It’s the sequel everyone is waiting for. The entire cast is back for this animated feature and with Brad Bird at the director’s helm for a sequel that proves good things come to those who wait. Check out my full review here below. Disney has released the second trailer for The Incredibles 2. Brad Bird, who directed the first film, returns to helm and write the sequel, which sees the Parr family now being able to live their superhero lives in the open. However, a new villain emerges with a brilliant and dangerous plot that threatens everything. In addition to the new trailer, we are also getting a new poster which gives us a new look at some of the other “supers” that will appear in the film and the new villain that threatens to destroy everything. Check it out here below. Disney and Pixar dropped a new sneak peek trailer for The Incredibles 2 during the 2018 Winter Olympics primetime coverage. We saw a teaser trailer at the end of last year, but that didn’t show much. The sneak peek trailer is the best look at the sequel yet, sharing plenty of glimpses at multiple scenes from the sequel. Check out the trailer below. You have to give credit to movie studio marketing teams for taking advantage of a current hot trend to push their upcoming film. Take for example the Google Arts and Culture app feature “Search With Your Selfie,” which allows users to discover art that closely resembles the selfie they just took. Now imagine Disney and Pixar implementing that with the cast of The Incredibles 2. To help announce the key cast members of the film, Disney has released a new set of images featuring the voice cast voice cast side-by-side with images of their characters done in the likeness of the app that everyone is talking about. In addition to the images, descriptions of the characters have also been shared. Check out the character details below. It’s still very surprising that it has taken us this long to get The Incredibles 2. With Pixar already releasing sequels and prequels to many of their titles, a sequel to The Incredibles is long overdue. But now we are getting one. And the recent teases that have appeared at D23 and the official teaser that dropped during Coco, hints at the Parr family adjusting to their new lives while also trying to figure out how to raise Jack-Jack, whose powers aren’t fully formed. Now we are getting a better sense of what that family life is like for the Parrs in a brand new image that shows them in full costume — all of them, including Jack-Jack. Check out the new image here below. The time has finally come for Pixar to reveal the first teaser trailer for The Incredibles 2, the long-awaited sequel that everyone has been asking for since the end of the first movie teased one back in 2004. While Pixar prides itself in its unique and original storytelling, the acclaimed animation studio does revisit their properties from time to time. Some are hits, others are misses, but they would not have a sequel or a prequel without a good reason. So imagine how fans reacted to the news that they would be getting a sequel to the film that probably deserves a sequel above all other Pixar films. Check it out below along with a poster.